The Feather 32u4 Bluefruit LE is our third review in the Feather line from Adafruit. Each board brings its own specialty feature to this low-cost line of dev boards and from its name, it’s pretty easy to figure out what this board has hiding up its sleeve. Bluetooth Low Energy is a protocol most commonly used for interaction with mobile devices. It has a short range but as the name implies, consumes less energy than other wireless standards like Wi-Fi or traditional Bluetooth. Mobile operating systems such as iOS and Android also natively support Bluetooth Low Energy (BLE) and allow devices to connect over the protocol without the need for timely and costly certification. These factors make BLE a great choice when trying to make a device that interacts with a mobile device, and this Feather has you covered for BLE. The Feather 32u4 Bluefruit LE is rocking the Atmel ATmega32u4 processor at its core. This is the same processor that was introduced to the Arduino line with the Leonardo. The 32u4 has become a standard for small Arduino boards looking to save some space but keep functionality. Unlike the ATmega328P found on the Uno, the 32u4 has built-in USB support, which saves chip count from adding a dedicated USB chip like the classically used FTDI or the ATmega16u2 found on newer Uno boards. The 32u4 has other advantages, in that it can show up on your system as more than just a USB serial adapter but also many other USB devices like HID or MIDI. Like other Feather boards, the 32u4 Bluefruit LE keeps the same form factor, and includes onboard li-po charging and a connector for your battery. This size, combined with the onboard battery and BLE, make this Feather a great choice for building mobile devices to connect with your phone. To get started with the 32u4 Bluefruit LE you will need to add the board to your Arduino IDE and also add the Bluetooth library. Thankfully Adafruit provides great step-by-step directions for this that will get you up and running in no time. After installation, this board can be programmed just like any other 32u4 based Feather with the added bonus of the BLE library. The Feather line is quickly developing into a great toolbox for the boards you need to suit your task. Familiarizing yourself with the line and designing projects around it means you can easily swap out the base board in your design for one that fits your needs at the time, whether that is Wi-Fi, BLE, LoRa, or no wireless at all. 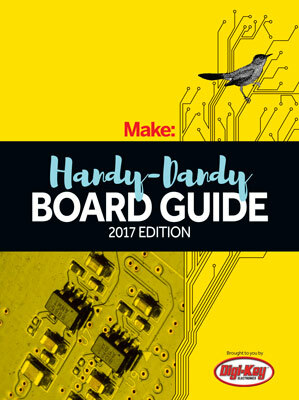 I look forward to seeing what other specialty Feather boards Adafruit brings us in the future. Yes, I would like my free PDF copy of the 3D Fabricator Quick Guide. This is offered with a subscription to the Make: weekly newsletter; you can unsubscribe at any time. Yes, I would like my free PDF copy of the Single-Board Computing Guide. Yes, I would like my free PDF copy of the Drone Flyer's Guide.